Based on his complaint, Vadapalani police resigned a case and collected the CCTV footages from the area to nab the robbers. He rushed inside to find the bureau broken open and valuables - four sovereigns of gold and Rs 1 lakh in cash - had been stolen. 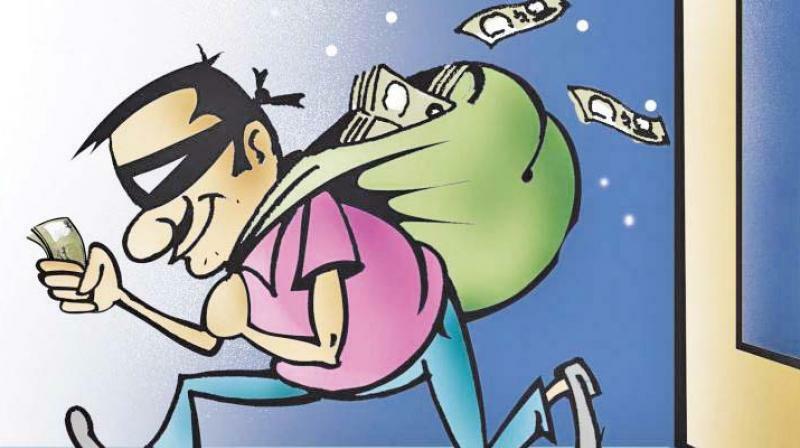 The masked burglary was the fourth burglary in the course of 24 hours as burglars had broken into homes in Vadapalani on Wednesday, besides cash being reported missing from an office in Vadapalani. According to police, Shankar, a resident of Bakthavatchalam street in Vadapalani who works for a private firm, had gone to work on Wednesday morning and when he came home in the evening, he was shocked to see the locks in the door broken. He rushed inside to find the bureau broken open and valuables - four sovereigns of gold and Rs 1 lakh in cash - had been stolen. Based on his complaint, Vadapalani police resigned a case and collected the CCTV footages from the area to nab the robbers. The police said they have received complaints from Shankar (35) of Vadapalani that burglars had broken into his house on Wednesday night when his family was away. When the family came home on Thursday morning they found the bureau broken open by robbers who had decamped with three sovereigns of gold and Rs 80,000. Gurumurthy of Nungambakkam had lodged a complaint with the Vadapalani police that Rs 14,000 that was kept in his office in Vadapalani had been stolen.